Whoever said three was a crowd? If you love being the center of attention then Crowd City is a game that is just right for you. Brought to you by VOODOO, Crowd City is a ‘real’ city of sorts. It is highly populated and its inhabitants have lived peacefully for a long time, well, until you showed up. You will disrupt everyday life in the 3D city by gathering followers. Yes, you read that right. 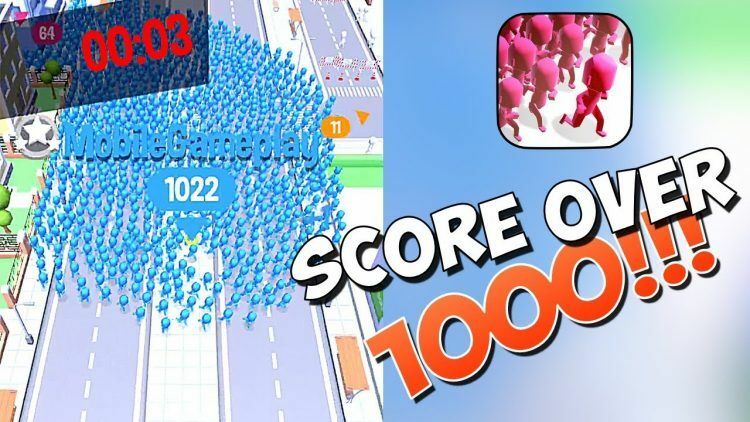 Your prerogative in Crowd City is to gather as many followers as you can. But not in the sense that you may be familiar with… you will bump into random people and infect them with your contagious color. Thereafter, they will instantly become your followers. The more followers you gather, the higher your chances of being the ultimate winner on Crowd City. To add an element of competition to the game, you will have to go head to head against opponents who are also trying to gather the most followers. But there is an interesting twist- once you infect one person with your color, they will also help you grow your followers by infecting others. As such, you will have an easier time amassing the most followers. To play Crowd City successfully, you cannot waste any time. You have to be quick in order to maximize the opportunity. Do not be afraid to go wild and do everything necessary to have as many followers as possible. Remember, if your opponent has one more follower than you, they can take you out and eliminate you from the game. Whether you win or lose, Crowd City is the kind of game that you will thoroughly enjoy. This is not to mean that you should accept defeat. If anything, you should do everything in your power to ‘shove it’ to your opponent. But the gameplay offers an experience like no other. It will make you feel like a leader as it gives you total control over your followers. When playing Crowd City, numbers mean everything. Ultimately, you will win when you have more followers than your opponents. If you check and realize that they have a higher number of opponents than you do, it is best to start attacking their followers. Be aggressive with this until you infect the last one of their follower with your color. Approach Crowd City like you would any other PVP fame, only attack when you are confident and sure that you will overpower your opponent. In other words, ensure that you have enough troops of your own first before going after theirs. To prove that your troop number is rising, check the right corner of the game. If your name appears first then you are way ahead of your competition. The only way to know where you will get your followers is to master the layout of the city and everything about it. Do not be in a rush, take your time to study, be confident that you know the areas, then attack! Go to the search box in Bluestacks and type “Crowd City” without the quotes, of course. That is it! You can now enjoy your freshly installed copy of “Crowd City” on your favorite PC!